as he demonstrates that his is still the best voice to come out of the Melbourne Fifties. Highlights include a standout version of "Endless Sleep" plus smash readings of Conway Twitty classics "Lonely Blue Boy" and "Is A Blue Bird Blue". Bill has included a nice version of J O'Ks "I'm Counting On You" for good measure. 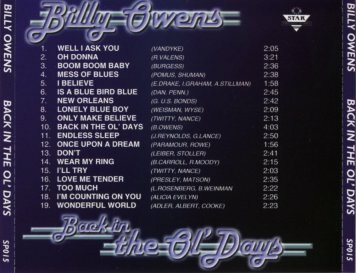 My personal highlight is the self-penned track "Back In The Ol' Days". Billy's recent concerts include the "Class of '59 Concert", on 2nd June, starring Billy Owens, Colin Cook, Malcolm Arthur, Judy Cannon, Betty McQuade, Honey B & The Stingers, and Itchy Fingers. as well as an appearance on "Good Morning Australia" with Malcolm Arthur, and radio interviews. 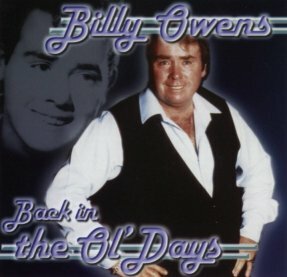 Billy thanks all the above for their great support of "good time rock 'n' roll"
This page was last updated on -->14th September 2001.